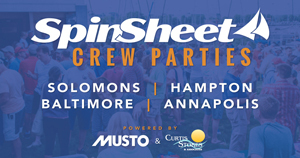 SpinSheet showed up on the water and at the post-race 2018 parties at the Helly Hansen Annapolis NOOD Regatta, hosted at Annapolis Yacht Club and presented by Sailing World. Here are some fun shots and a little video with Sailing World’s Ted Reugg at one of the parties as well as an excerpt of Dave Reed’s post-race report. Find on-water photos for purchase here. Florida-native John Brim and his crew on Rimette not only scored their first-ever major regatta win in the J/70 class, but also earned the coveted title of Overall Winner at the event. Victory didn’t come easily for team Rimette. In fact, it all came down to the eighth and final race of the weekend. Heading into it in second place, the crew had difficulty getting off the starting line and then committed a port-starboard foul, for which they had to perform a penalty turn in light air. Fortunately, Rimette’s tactician Taylor Canfield soon made a call that put them on the path to redemption. As the Helly Hansen Annapolis NOOD’s overall winner, Brim earns a berth in the Helly Hansen NOOD Caribbean Championship Regatta, presented by Sunsail in the British Virgin Islands in October. Other class winners also had to battle back from poor performances in Sunday’s first race. Etchells champion Matt Lalumiere, of Annapolis, started the day with a considerable lead, but a wind shift during race one allowed several boats to pass his team on Ca$h Money. 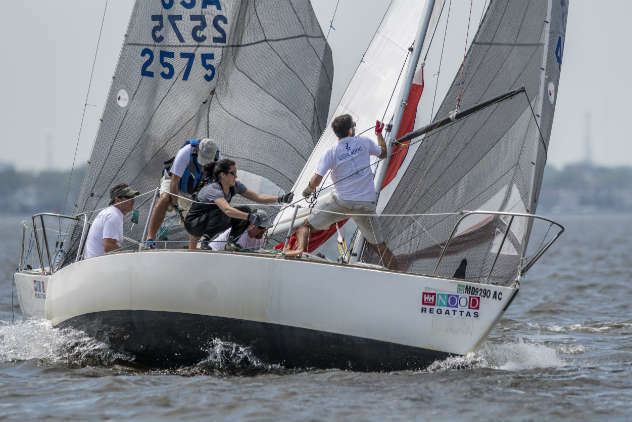 Similarly, local J/22 class winner Zeke Horowitz and the Uncle Fluffy crew had to face their own challenges on Sunday despite starting the day with a strong lead. A bad start during race one landed them in the back of the 32-boat fleet. The team then had to recover from another bad start in the second race, where they were able to claw their way to first place after rounding the first mark in eleventh. Horowitz said he knew all they needed was to complete the race in the top 10 to maintain their overall position, which made the eventual win even more sweet. “It was really fun to be able to win the last race in a regatta like this,” he said. 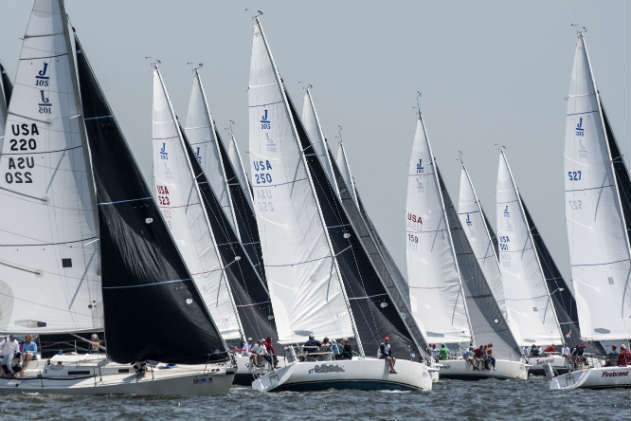 Including Horowitz and Lalumiere, local Maryland-based sailors placed first in 10 of 13 divisions this weekend. 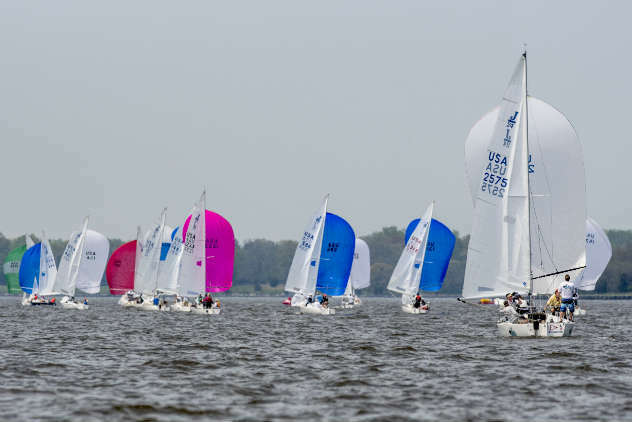 The Helly Hansen National Offshore One Design Regatta continues its 30th anniversary season June 8-10 in Chicago, Illinois. More results below. For comprehensive results, visit yachtscoring.com.